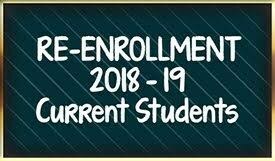 The week of April 2-9, 2018 has been designated re-enrollment week for the 2018-19 school year. Please check your child’s homework folder for the re-enrollment form that will be going home on Monday, April 2, 2018. Follow the instructions on the form and return it to your child's teacher on or before April 9, 2018. A form must be filled out for each student who intends to re-enroll. Space is very limited for the 2018-19 school year. Click below for re-enrollment form.